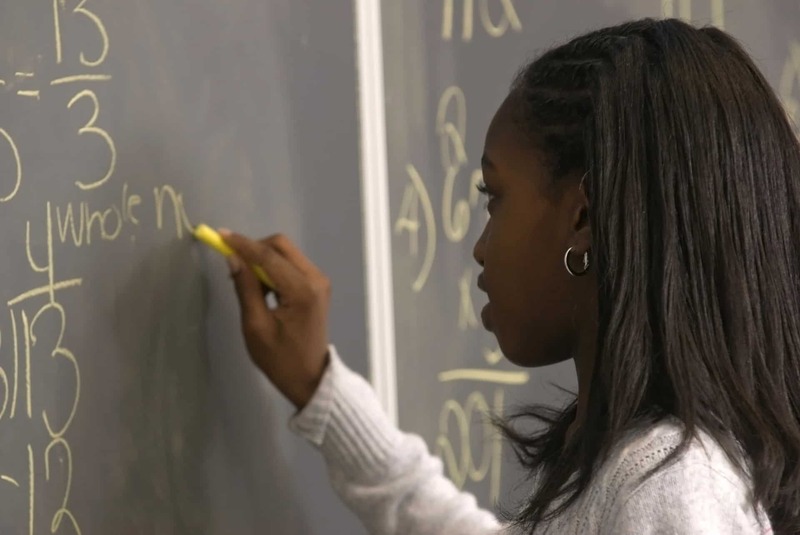 As the Elementary Instructional Specialist in Mathematics for East Hartford, Connecticut, I have been tasked with designing a curriculum plan that builds a strong foundation in number sense so students have the content knowledge necessary to access algebraic reasoning. For educators to succeed with this hefty task, we need to ensure that they have the road map necessary to navigate students through the educational journey. The Materials Adaptation Project provided the opportunity for my district to look critically at the enVisionmath 2.0 program we use and helped create that roadmap for our teachers. The enVisionmath 2.0 Materials Adaptation Project was designed to allow Student Achievement Partners, districts, and Pearson to work collaboratively to ensure that the program and materials are aligned with the standards and the progressions. We hosted a convening in August 2017 and worked together to draft the guidance documents. Then it was up to each of the districts to ensure the new guidance made its way into classroom instruction. Following the convening, my original plan was to have only the three teachers who participated in the convening pilot the guidance documents; however, our teachers and our students could not afford to have another year of instruction that did not effectively leverage the most standards-aligned aspects of enVisionmath 2.0. 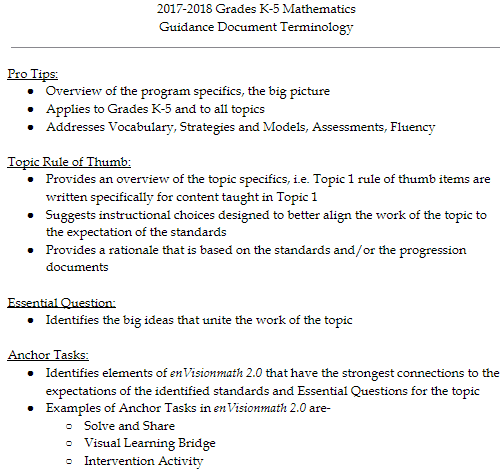 So, I set about using the guidance documents to help administrators, instructional coaches, and teachers to understand the grade-level content standards and use the Anchor Tasks identified in the guidance documents for planning. I modified the guidance documents created at the summer convening to fit our district needs. In order to fully understand the intent of the standards, we have to intentionally plan and we need a curriculum document that supports the process: What, Why, and How. The focus for the 2017-2018 school year is on the big picture: teaching grade-level content. Prior to planning for effective instruction, teachers need to know what they are teaching and why they are teaching it. This information on “why” can be located in the Pro Tips and the Topic Rule of Thumb. The Anchor Tasks supply the ”how” for teaching the content. I added supplemental resources to this section to highlight additional programs we own as a district to embed as part of The Workshop Model. Teachers did not receive professional development prior to using the guidance documents. I needed a reference page so teachers would have a shared understanding of the terminology and purpose of the new documents they were expected to use for planning. 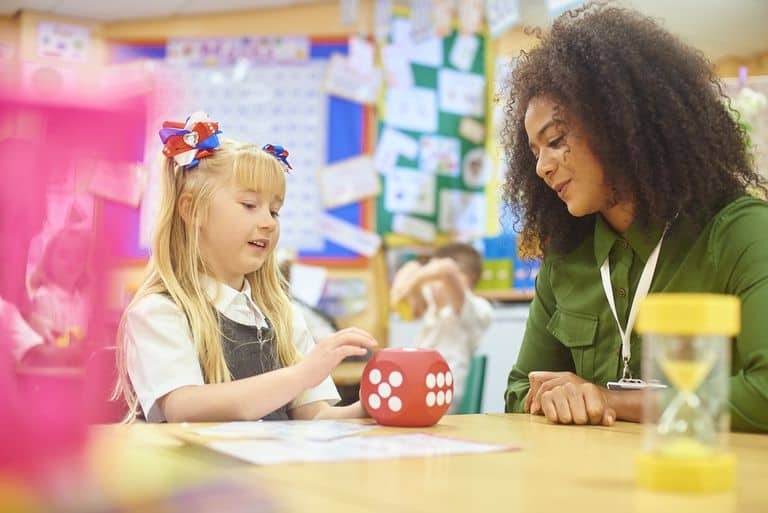 As teachers are learning and growing, and focusing their instruction and time in new ways, many comfortable practices and habits must shift to a new mindset which will change practices and beliefs. The previous lack of a curriculum and overreliance on the textbook has resulted in gaps in students’ prior knowledge. 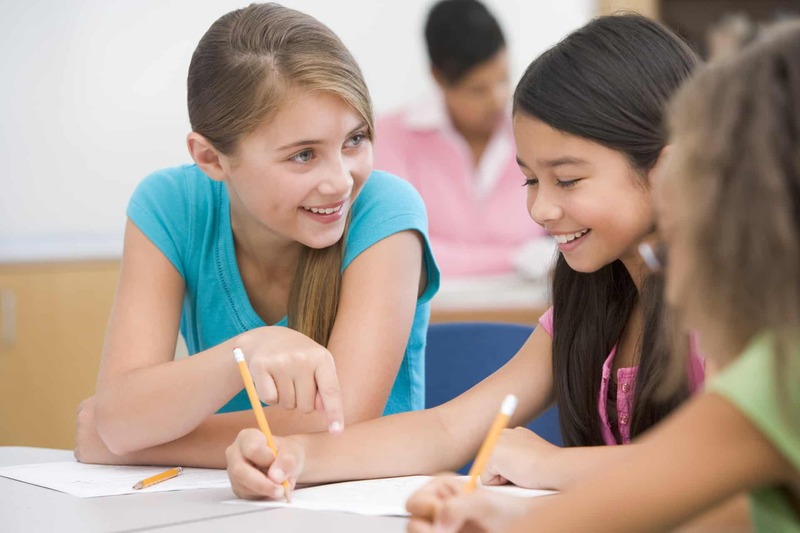 Teachers find themselves spending too much time re-teaching the foundational skills necessary for students to access the grade-level content and many teachers have noted that they gravitate towards re-teaching the whole class versus creating small groups with targeted interventions. 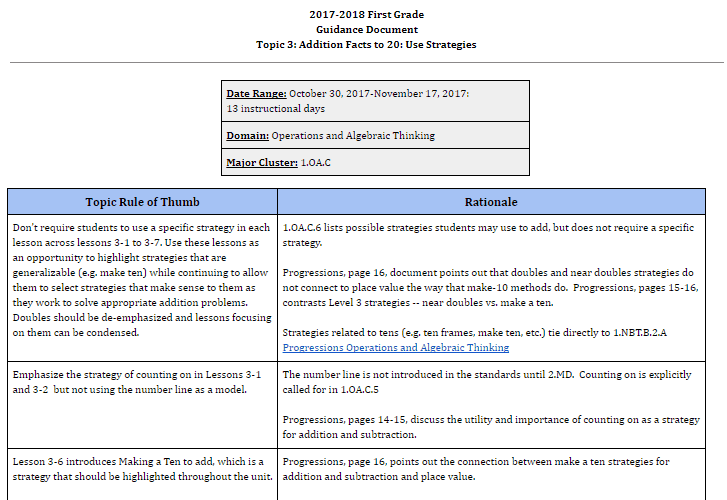 As we continue to refine our practice with The Workshop Model and begin to utilize the Coherence Map, which illustrates the connections among the standards both within and across grades, we will see a rise in the number of students that are able to access new content knowledge and a decline in the number of students with significant gaps in their foundational skills. I am also able to support teachers by assisting with the planning of instructional coach, staff, and grade-level meetings. Each of these represents an opportunity for us to have courageous conversations about misinterpretations and misalignment of the standards (as part of past practice), and misconceptions about what the standards measure and how. This has proven to be a challenging process! . . . but a worthwhile one. These conversations help develop our knowledge and ensure that we can provide our students with the challenging and targeted mathematics instruction that will support their success in college and career. In the coming months, I will continue to revise the guidance documents by honing in on focus – ensuring support for the most critical content and embedding supplemental resources. I will also begin embedding supporting and additional clusters throughout the year as workstations, so that they are no longer taught as isolated topics. I will infuse fluency resources, provide research-based evidence on the most effective and efficient instructional models and strategies, and create formative assessments that assess content rather than strategies. I will continue to be mindful of how to make curriculum, instruction, assessment, and professional development cohesive so that through the implementation of these changes, we ensure that we are meeting the needs of both our teachers and our students. I teach EnVision 2.0 in New Jersey. Would it be possible for you to share the scope and sequence you have developed for Kindergarten, 1st, and 2nd grade? I would be very interested. We have felt that we are not supporting students using the program as-is. I would be very interested in seeing your scope and sequence for grades K-5 as well. Thank you so much! Would it be possible for you to share the scope and sequence you have developed for Kindergarten, 1st, 2nd, and 3rd grade? Thank you! I have a teacher using EnVision 2.0 in her special education classes in Minnesota. Would it be possible for you to share the scope and sequence you have developed for Kindergarten, 1st, 2nd, and 3rd grade? These students have not made growth in 2 years, so would be very interested to see what you have done and if it would help. I’d like to take a look at your document, as well. Thanks, from an Ohio teacher! Could you possibly share 5th grade with me? Would you be willing to share the scope and sequence for grades K-4? I think it would be very beneficial for teachers in my building. Would you be willing to share scope and sequence for grades k-4? Yes, just send me an email and I will forward the documents. We just started our first year of enVisions in kindergarten and 1st grades in my district in Missouri. 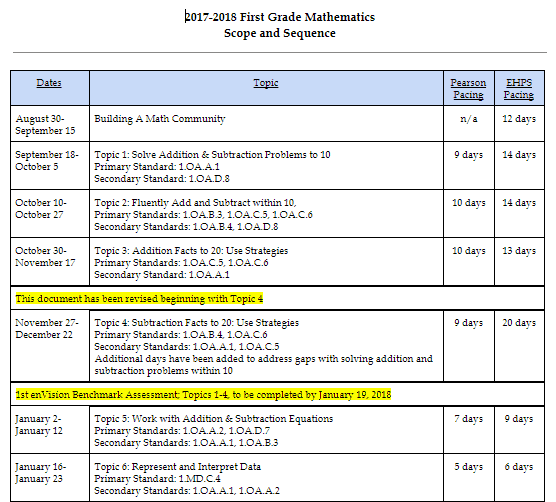 Would it be possible for you to share your scope and sequence for these two grade levels with me. As a building principal, this will help me gage where my teachers need support as we reflect on the topics we are teaching this year. Thank you in advance! I am so happy I stumbled onto your site. One of my teammates and I were just going through Envision 2.0 last weekend to see how it really aligned to our standards. Can I get the scope and sequence for grades K-5 for my school? Thank you so much for all of the hard work you put in! Absolutely! I will send the S&S on the 29th, this week I’m slammed. First grade team in Illinois here! May we have a copy of your pearson math scope and sequence for first grade? We are struggling with the same issues here in Clinton, CT. Would you be able to share your K-5 scope and sequence? Jaime would you kindly share the k-5 with us as well? Thanks so much! Would you be willing to send the 3rd grade scope and sequence? Hi Jaime. I hope you are well and miss being able to work alongside you each and every day. Your expertise is SO incredible in this area! Would you be willing to share your documents with me as well? We are working to implement 2.0 too! If I am able to find away to invite you to visit our district to share your expertise personally, I would love that! I will be in touch again soon! We are working with enVisions here in New Mexico. I really like the scope and sequence that you developed. I am also very interested in the Guidance Documents that you created as well. If you would be willing to share what you have I know we could use them to support our students. I would like to request a copy of both the Scope and Sequence and Guidance documents for K-5 or K-6. Our school goes from K-6. Another question or request is how are the teachers working interventions? Are they using both the interventions and enrichment activities? Absolutely! I will send the S&S and a some examples of the Guidance documents on the 29th, this week I’m slammed, my focus is K-5 so I don’t have the documents for 6th. We would so appreciate your Scope and Sequence for Grades K-5 (or any you have available). We have newly adopted envisions are are looking for the best way to maximize instructional time. Your documents look like they will be helpful. Thank you! I am also interested in your Scope and sequence for K-5. Our school is in our second year of Envision and the teachers seem to like it but we are still struggling with pacing. Would you be willing to share your K-5 Scope and Sequence and examples of the Guidance Documents? We have been using enVision 2.0 for approximately 4 years, and your documents would be very helpful. We are in our first year of implementing Envision Math 2.0. I would truly appreciate your resources. We are struggling with pacing and would love to see your scope and sequence for K-4. I’m also interested in the guidance page, if you are willing to share. Thank you! I would truly appreciate your scope and sequence and your guidance documents for K-5. We just started Envision 2.0 this year. This resources would really help us with our pacing and guidance. Thank you so much. Your documents look extremely beneficial. I would like to request a copy of both the Scope and Sequence and Guidance documents for K-5. Thank you so much! I would like request a copy of the guidance documents and the Scope and Sequence for 1-5. Thank you very much for your willingness to share. My district uses Envision and want to make the most of it for our students. We would really appreciate you sharing your guidance documents for K-5 with us! Thanks! Would it be possible for you to share the scope and sequence you have developed for Kindergarten, 1st, and 2nd grade? I would be very interested. We have felt that we are not supporting students using the program as-is. Hi there! This has been so helpful! May I please have a copy of your scope and sequence for 2nd? Thank you! Impressive! We are a small rural district of 260 students. We are in the midst of trying to do what you have done. Please send me copies of the work you have done. THANK YOU! What impressive work! We too are in year 1 of implementing EnVision 2.0. I would like to request a copy of both the Scope and Sequence and Guidance documents for K-5. Thank you so much for your willingness to share. I am in the process of transitioning into a new position as a K-5 math specialist. My district currently uses EnVision 2.0 and I would love to have the Scope & Sequence along with the guidance documents for K-5 that you created. These documents would be so beneficial to myself and colleagues if you are willing to share. Thank you in advance!! Would you be willing to share your scope and sequence documents for K-5? Thank you. Our district teachers uses EnVision 2.0 and want to make the most of it for our students. Would you please share your pacing guides documents for K-5 with us! Thank you so much. My school is thinking about using enVision 2.0 in the next school year. Can you share your scope and sequence/pacing guides so I can better help my teachers the best way to implement the program. Thank you so much! My school is thinking about using enVision 2.0 in the next school year. Can you share your scope and sequence/pacing guides for K-5? Oh and 6th if you have done that one. Thank you so much! I would also like to see your scope and sequence for grades K-5 as our district has just adopted the enVision program for the next school year. Thank you. 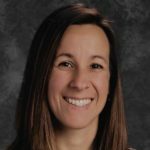 About the Author: Jaime Pitkin is in her second year as the Elementary Instructional Specialist of Mathematics in East Hartford, Connecticut and has been in education for 17 years. Jaime previously served as an Elementary Teacher for six years, Middle School Mathematics Teacher for six years, Math Coach for two years and Intervention Coach for one year. Jaime enjoys spending quality time with her husband and three daughters, ages nine, seven and three. 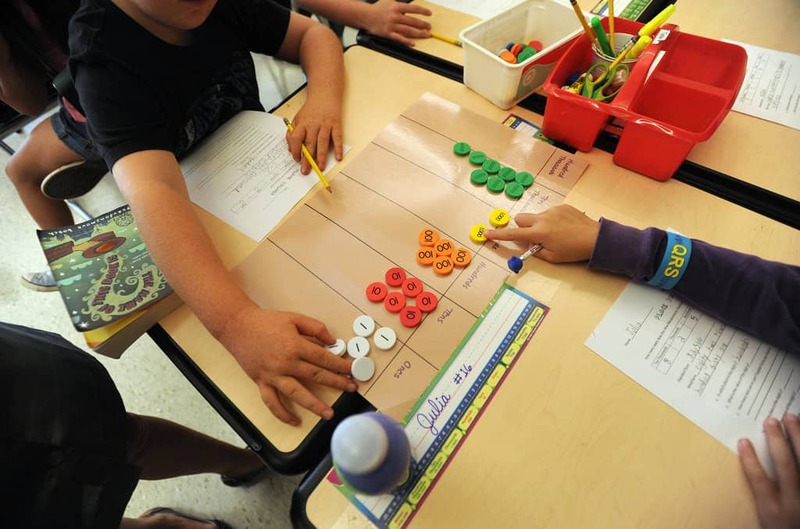 What do teachers need to know to make decisions about adapting math materials?